I used to love Olive Garden when I was little but I always thought the name ‘Olive Garden’ had very little to do with the actual experience of eating there. I do remember an olive or two in the salad and I suppose there might be a garden involved somewhere in the process of producing the food, though I doubt it looks very much like the gardens any of us have at home. In warmer weather, I do crave lighter foods and I like to taste vegetables throughout as many courses of the meal as possible. Salads are of course incredibly easy to make this time of year but with a bit of work, it’s possible to make the entire meal taste bright and vegetal and that’s exactly what many of us crave as summer sets in. I love the fresh goat cheese from Lynnhaven. Their cheese is grassy, a bit tart and perfect for making a vegetable dish a bit richer. I’ve found great fresh goat cheeses at markets in nearly every region of the US. 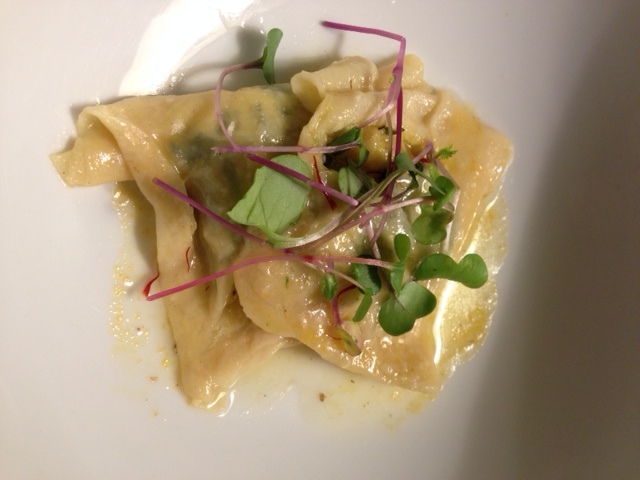 Most of my guests are omnivores but none of us misses meat when we eat this ravioli. Nor do we miss the unlimited salad. A regular bowl of salad on the side seems to do just fine. Start by making a batch of basic pasta dough. I use a little extra egg yolk when I have very fresh eggs on hand. Turn processor on and slowly add ½ cup of water until dough forms into a ball. Wrap tightly in plastic wrap and chill in the refrigerator for at least an hour.